“I never could have imagined something so big and beautiful. I already feel like it’s my home.” – Emeline, 14 years old. Emeline and her family escaped violence in El Salvador before being taken in by the Catholic Worker House in Oakland. On Saturday, they were introduced to their new home, furnished with the support of our donors and Chipman Relocation and Logistics volunteers. The 4-unit home for immigrant and refugee families in Oakland was completely empty when we were introduced to it just a couple months ago. The hope was to house three families and staff, but they didn’t have furniture or appliances yet. We reached out to Chipman Relocation and Logistics who volunteered their man and woman power to get the job done! With their hard work and your generous donations, we were able to outfit ALL four homes in under four hours!! Each family will have their own living space, which volunteers worked hard to complete. Bunk beds were built, furniture was set up, beds were made, kitchens were outfitted and volunteers even landscaped the backyard! Thank you for your part in making this a dream come true for these families! You not only gave them a gorgeously decorated and equipped home, you gave them beds for restful nights, a table to join together for family meals, and endless hours of playtime with toys and bikes! Your generous donations will live on for years, as families move out and become self-sufficient, and other families move in and share the gifts you gave last weekend. Bedroom complete with two bunk beds and a double bed for a big family. Lisandro, age 3, can't wait to finally move in. In the other bedroom they have bunk beds , toys and a changing table for all the babies who will occupy the home. Bedrooms for the volunteer live-in staff were complete with desks and comfortable new beds and bedding! 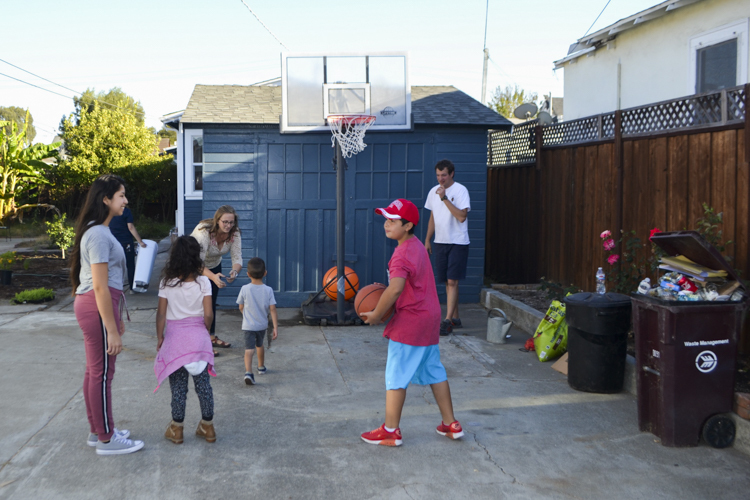 The kids were most excited about the yard and the basketball hoop. The former Catholic Worker House was on a busy street without a gated yard. A special thank you to our Grateful Gatherings Sponsor Chipman Relocation and Logistics for giving their time, energy and talents! A special thank you to an anonymous donor who donated funds to supply all the appliances for ALL 4 houses! A shout out to John at Airport Appliance in Concord for giving us a great deal! Thank you to landscape designer Nancy Scanlon and her volunteers who brought an endless supply of energy and muscle weeding the yard and planting trees and plants. Bob LaSalle, Vice-Chair of the Board of Catholic Worker House, spoke to the group and wanted to share this with all of our donors. On behalf of the entire Oakland Catholic Worker community of guests, staff, and volunteers, please accept our heartfelt and sincere thanks for the amazing gift of dignity and joy shared with us last weekend by the Grateful Gathering Community. The children were so excited by the bikes, the dolls and the many toys, and the quiet beauty of their new home brings a sigh of relief to their parents from the many traumas they have survived. Please know that we pray for each and every volunteer and donor who helped make this incredible event possible. Stay in touch with Grateful Gatherings! We’re in Danville Saturday and will be posting updates via Instagram and Facebook. Thank you and looking forward to seeing you next time!